Incontinence in female dogs is a term used to describe involuntary urination, day or night. The problem can have several causes which effect the body's ability to close off the flow of urine, or when the bladder overflows. These can include urethra muscle control problems, and problems common to all dogs including infection and stone formation. Source: The pictures in this section are reprinted with permission by the copyright owner, Hill's Pet Nutrition, from the Atlas of Veterinary Clinical Anatomy. These illustrations should not be downloaded, printed or copied except for personal, non-commercial use. This is the most common cause of female dog incontinence. It can be inherited or triggered by spaying. After spaying the condition usually occurs 3 years after being neutered, but can happen up to 10 years. Certain breeds are more susceptible to the condition including Retrievers, Huskies, Appenzellers, Briards and Newfoundlands. Researchers have not specifically determined the cause of USMI. It is thought that hormonal change might be at fault, although recent work has refuted this finding. Diagnosis of USMI is done with a urine culture and x-rays of the urinary tract. Often, the condition is diagnosed after other causes of incontinence such as infection, cystitis (bladder inflammation) and canine cognitive dysfunction are ruled out. USMI can be managed medically or surgically. Medical management is widely used and is appropriate for the majority of affected animals. Surgical treatments are also described: surgery is used for patients who are refractory to medical management or for young animals where the health effects or cost of long-term medication is of concern to the owners. Treatment options include the use of prescription medications and surgery. There is also a homeopathic natural approach that might provide temporary relief as mentioned below. Prescription medications include estrogen therapy and a class of drugs called sympathomimetic agents (Phenylpropanololamine). Medications work by helping the muscle that closes off urine in the urethra increase the amount of pressure it uses when closing off the flow of urine. Most dogs will not experience side effects, and if they do, they include restlessness, anxiety, aggressive behavior and diarrhea. Surgery is used if a dog doesn't react well to mediations or if you prefer this approach. The goal of surgery is to move the bladder into a better position. There are several surgical techniques available that can be discussed with your veterinarian (colposuspension,urethropexy, urethral sling suspension, and injection of collagen). There is a high rate of success with this approach (80% improve, 50% cured). Bacterial infection is the most common type of infection and is usually seen in female dogs because they have a short urethra (tube that carries urine from bladder to outside of body). If not treated the bacteria can colonize up the urethra, to the bladder, and then go from the bladder to urethra to the kidneys (pyelonephritis). Urine is the body's natural way of keeping an infection from forming and thereby preventing female dog incontinence. Urea, the main ingredient in urine, kills bacteria in the bladder and the entire tract. When your dog doesn't drink enough or when there is an obstruction, the flow of urine isn't able to do its job. Even walking your dog one more time a day will encourage an additional opportunity for your dog to urinate. To treat infection your veterinarian will prescribe anti-biotics. As a homeopathic addition to anti-biotics or as a preventative you could try UTI-Free Formula for pet urinary tract infections. Certain natural ingredients are associated with urinary support. Cranberry juice can also be of help for incontinence in female dogs since it acts to keep bacteria from clinging to the wall of the bladder. Stones tend to form when there is a buildup of minerals that attach together in the urine. 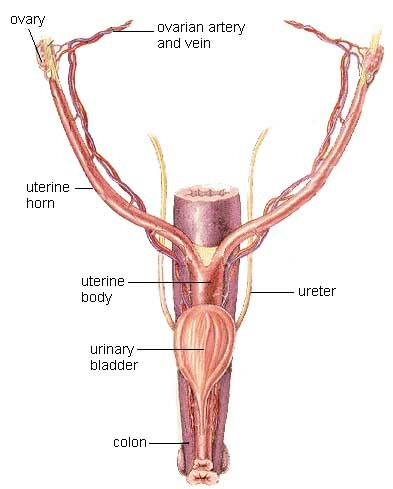 They can form in any part of the urinary system. As stones become larger, they can begin to block the flow of urine. Other symptoms can include blood in your dog's urine and pain when urinating. In severe cases such as when the ureter is blocked (tube that leads from the kidney to bladder), your dog might vomit and act lethargic. Diagnosis is done by analyzing the urine, x-rays and by feeling your dog during the visit to the veterinarian. Ultrasound could also be helpful. In dogs, struvite formation is associated with bacterial infection. Urate stones can be dissolved with the medication allopurinol. Your veterinarian may also suggest a change to a low protein Prescription Diet which can help to prevent these types of stones from forming. The other type of stone, struvite is associated with dogs that also have a bacterial infection. These types of stones can be dissolved by switching to a special diet such as Hill's Prescription Diet s/d. This diet will need to be the only thing your dog eats for a period of 3 to 6 weeks. In older dog's a condition called canine cognitive dysfunction can be the cause for female dog incontinence. It is a neurological condition where you dog cannot effectively control the bladder. Other rare causes include bladder wall fibrosis (thickening of the bladder wall), bladder and urethral neoplasia (abnormal cell growth such as a tumor), and bladder paralysis. Female dog incontinence caused by dog ectopic ureters is diagnosed with a bladder dye study. The condition is treated with surgery to move the ureters to their correct location.